Who says you can’t be your own Valentine? In honor of Valentine’s Day, I’ve spent this week doing things that I love. This week I spent a few very busy days at my internship filling in for editors who were out on “holiday.” I got to write multiple magazine articles and web stories, including an article about everyone’s favorite boy band, 1D! (And everyone can be quiet about Niall. He’s definitely the cutest). 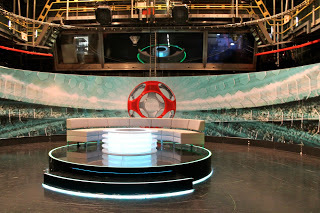 On Tuesday our class got to tour the BBC! I was incredibly excited to get the chance to go to one of the world’s foremost news organizations. The tour was more focused on the TV shows the BBC produces rather than the journalism work it does, but it was still very informative and fun. I toured with four other Mizzou students, but the rest of the kids in our group were actually from a high school in Norway. They spoke decent English, but were obviously not interested in being on this tour, which I’m sure they were required to go on with their school. Our tour guides kept addressing us as if we were from Norway, so I got to be Norwegian for the afternoon! 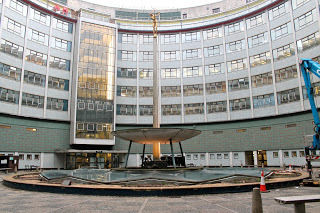 BBC Fountain that no longer flows because it caused workers to have too much flow elsewhere, if you know what I mean. My Norwegian classmates and I saw a rehearsal for the British taping of Who Wants to be a Millionaire (yes, it’s still on), a taping for a quiz show and we walked on the set of a football talk show. Unfortunately, the Norwegian kids monopolized the football set, so I could only snap a picture of it when we left instead of take a picture behind the desk. We also got to see the dressing room where Lady Gaga, Coldplay and J-Lo have gotten ready for their shows. Kickin’ it at the football talk show set. Hanging out at the BBC! At the end of the tour, our guides asked for volunteers for a game show. No one volunteered, but once a prize was offered, I decided to give it a go. Two other Mizzou classmates joined me. The quiz show turned out to be “The Weakest Link.” I lost because my buzzer wasn’t working properly (really, the guide even told me it wasn’t!) so I didn’t get the grand prize, which was … a BBC pen. Maybe I was better off being the weakest link after all. Oh no. No, no, no. Appearance has nothing to do with the quality of journalistic work, good sir. I cannot name a single BBC reporter who is known for looks over reporting. 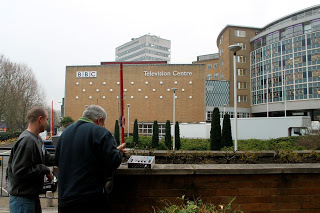 I respect BBC reporters for their dedication to fairness, hard facts and “living the story,” not their appearance. 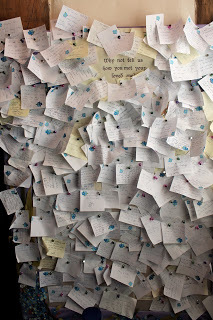 I wish the tour guide could see this, too. 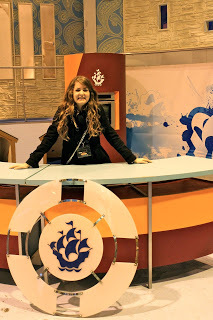 Nonetheless, it was very exciting to be at the BBC and I’m very grateful for the chance to tour, even if I ended up being the weakest link for a short time. On Thursday, the day of love, I walked along the entirety of the South Bank with my fellow Mizzou students and soaked in the sights of couples waiting in line for a romantic spin around the London Eye. 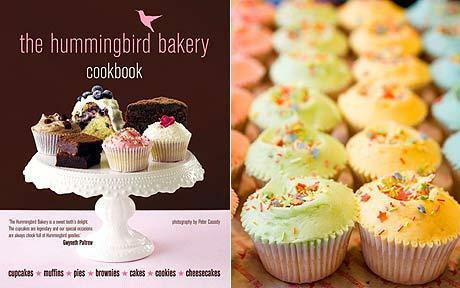 I also saw many men buying flowers at the tube station and carrying bags of Hummingbird cupcakes onto the train. Nothing got me like the cupcakes did. They are my favorite food of all time! On Friday, I got up earlier than I do for work to continue my literary tour of England. 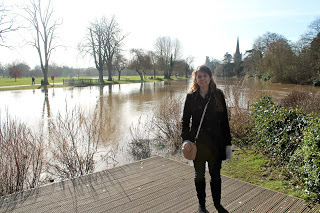 This time, my travels brought me to Stratford upon Avon, the Cotswolds and Oxford. My roommates and I booked this tour about a month ago and have been looking forward to it ever since. The sun was shining (yes, really!) and we were the only ones on our tour! I fit right in with the Hathaways, don’t you think? 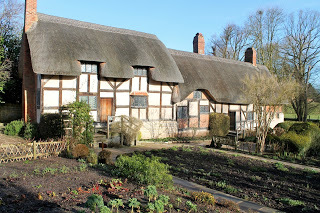 Our first stop was Anne Hathaway’s cottage in Stratford. This Anne is not the famed Princess Diaries actress, but was Shakespeare’s wife. 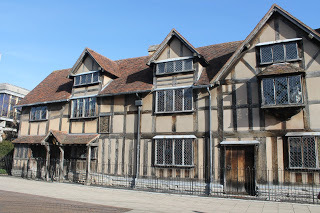 I was shocked to learn that Anne was 26 when she married 18-year-old William Shakespeare. Why did this cougar commit to such a younger man, you ask? Because she got pregnant! Shakespeare and his bride had a shotgun wedding and their daughter was born 6 months later. Can you say oops? Despite the rushed nuptials, Shakespeare and Anne did have a happy marriage. Anne inherited a lot of money from her father’s death, which she was able to share with the penniless bard. Anne was the oldest of her father’s seven children. Her mother died when she was 8, so she was in charge of taking care of her three younger siblings until her father remarried when she was 11. Anne grew up to be an independent, strong-willed and witty woman who was entirely capable of keeping up with Shakespeare’s antics and of course, inspiring his sonnets. Let me just say, I was so happy to be back in the English countryside. Maybe my heart belongs more in the open air of England than in the city, even though I do love London. Or maybe I had just been looking forward to visiting Stratford for so long that I couldn’t believe the day had actually come. 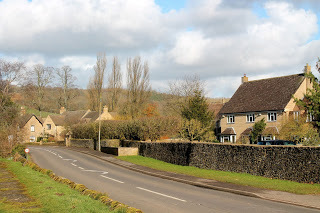 I saw quintessential England at its finest: rolling green hills, grazing sheep, small cottages and budding flowers. I was (read: am) in love. 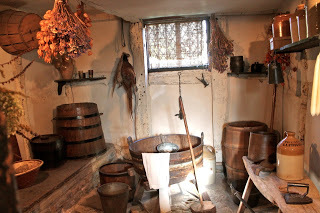 The Hathaway house initially had only two rooms: a living room and a kitchen. Anne’s brother added a second story onto the house after their father’s death. 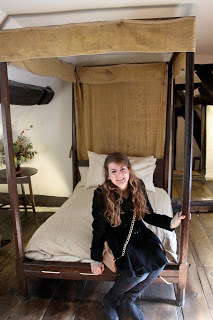 I visited each room and even sat on a bed that Anne and Shakespeare had sat on (even though I wasn’t supposed to. I know, I’m so bad). One day I’ll have a story to put here! We spent a few hours walking around Stratford. 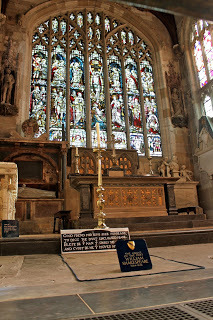 We saw Shakespeare’s grave, which is marked with an ominous message for those who outlived him: “cursed be he who moves my bones.” We also saw his birthplace, the river Avon, the theater where the Royal Shakespeare Company performs and one of Shakespeare’s favorite pubs. It’s incredible to think that all of these buildings have lasted from the 1500s into the 21st century. The bard’s final resting place. 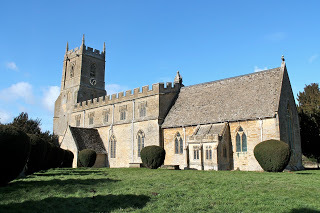 I was sad to leave Stratford, but so happy to stop in the Cotswolds, which are some of England’s only surviving medieval villages. 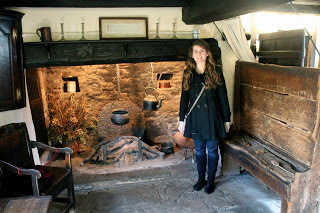 The houses in the Cotswolds were built in the 1300s and still stand today! Real, ordinary (but very wealthy, I’m sure) people live in them now. 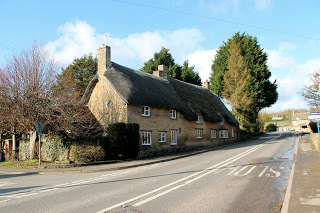 It was so quaint and beautiful. Aside from the occasional car passing on the left-hand side of the road, there was only the sound of chirping birds and rustling wind. So…when can I move in? On our way to Oxford, we made a quick stop in Woodstock. 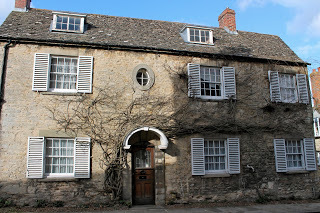 I snapped a picture of Chaucer’s house and tried to get a picture of the castle where Churchill was born, but the guard wanted us to pay 21 pounds to take a picture. No thanks. Our last stop for the day was Oxford, the famous university town. 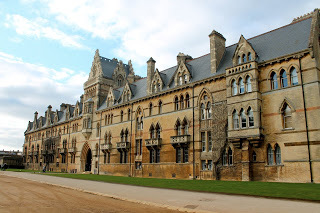 Did you know that Oxford is actually 39 separate colleges, not just one university? Now you do. It’s the oldest university in the English-speaking world with an acceptance rate of only 20.5%. 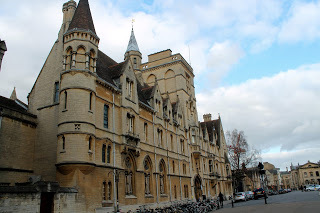 About 21,000 students attend Oxford and they come from all over the globe to do so! We walked around as much of the town as we could. We saw beautiful buildings built from limestone, streets filled with cute bookstores and coffee shops and many smart students walking around. Our tour guide brought us to a secret pub that provides an “education in intoxication,” which proves that Oxford students are educated in many areas during their collegiate years. Ok, as if Oxford wasn’t already awesome. Who said Oxford is all work and no play? I can’t imagine going to an ancient and prestigious school where the likes of John Locke, Oscar Wilde, Lewis Carroll, J R R Tolkien, Margaret Thatcher and so many others have gone. Then again, I go to the same school that Brad Pitt and Jon Hamm went to, so it’s pretty much the same thing. 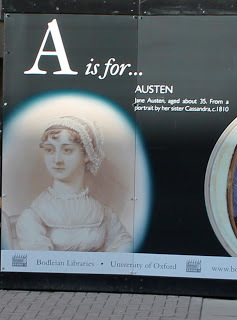 All in all, I had a great day in the English countryside fulfilling some of my literary dreams. Luckily, my literature-themed days are not quite over. This weekend, I’ll get to experience one of the most exciting days I’m sure to have in England. Can anyone guess where I’m going?